It doesn't matter whether you are looking for a spinning wheel with "old-world" charm like a Kromski Minstrel or a 30" Schacht-Reeves Saxony style spinning wheel. 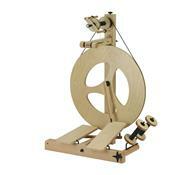 Or maybe the modern look and technology of the Majacraft Suzie or a Lendrum Upright spinning wheel. . . we are here, ready to serve you. We have most wheels in stock for FAST, FREE SHIPPING (U.S. lower 48 - some spinning wheels have free shipping to a few other countries too). If you are close enough, come in so you can try wheels you are interested in buying. Give us a try. . . and take advantage of our many years of experience and dedication to customer service. Click on a wheel or name to get more information about that makers offerings! JOY 2 COMBO Package (Includes Bag!!). . .